Leave it to Corvette® to improve upon perfection. That's precisely what happened in 1967, when the first generation of the Sting Ray™ culminated in the fabled L88. Now, you can experience the singular thrill of owning the most sought-after Vette® of them all - simply by placing your order for this die-cast replica from Franklin Mint Precision Models. A corveted Corvette®... a model to die for. 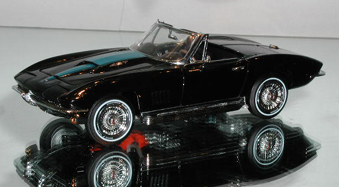 The most sought-after Vette® of all is captured in a model equipped with a replica 427 cid engine. Under the hood, the gleaming side-mounted exhaust system and all the precise detailing and functional features you've come to expect. Capturing the raw, tenacious power of the ultimate Sting Ray™ L88. Loaded with authentic operating features, including retractable headlights.